Also serving communities of Goodlettsville. There are 35 Assisted Living Facilities in the Madison area, with 4 in Madison and 31 nearby. The average cost of assisted living in Madison is $3,068 per month. This is lower than the national median of $3,346. Cheaper nearby regions include Hendersonville with an average starting cost of $2,986. To help you with your search, browse the 183 reviews below for assisted living facilities in Madison. On average, consumers rate assisted living in Madison 3.9 out of 5 stars. Better rated regions include Hermitage with an average rating of 3.9 out of 5 stars. Located approximately 30 minutes to the north of downtown Nashville, Madison is listed as one of the best places to retire in the Nashville Metropolitan area. Easy access to shopping, a variety of parks for outdoor activities and close proximity to Music City makes Madison a thriving place for seniors to retire. Regulated by the Tennessee Department of Health, there are 36 assisted living facilities in the area and four in the city limits. These facilities provide room and board and medical services for seniors who need help with daily living tasks. Seniors living in Madison may have a slight challenge when paying bills and purchasing necessities due to the cost of living of 102. This is higher than the state’s average of 96 and slightly higher than the national average of 100. Crime in Madison is ranked on a scale from one (low) to 100 (high). Property crime is 63.3, which is higher than the national average of 38.1. Violent crime is 61.4, which is also higher than the national average of 31.1. Seniors living in Madison may not feel as safe as they do in other cities. Summers in Madison are long, hot and humid, with highs around 90. This may be a problem for seniors who are sensitive to the heat. Winter lows are around 26, with approximately 3 inches of snow per year. The Madison area is home to world-class medical facilities, including TriStar Skyline, in the event of medical emergencies or illness. Senior Ride of Nashville provides an affordable, assisted ride service that matches seniors with a volunteer driver for medical appointments, errands and outings. The service is available on demand. Madison has an array of community resources for seniors, including the Council on Aging of Middle Tennessee, an organization that supports older adults and caregivers, as well as two senior centers. Assisted Living costs in Madison start around $3,068 per month on average, while the nationwide average cost of assisted living is $4,000 per month, according to the latest figures from Genworth’s Cost of Care Survey. 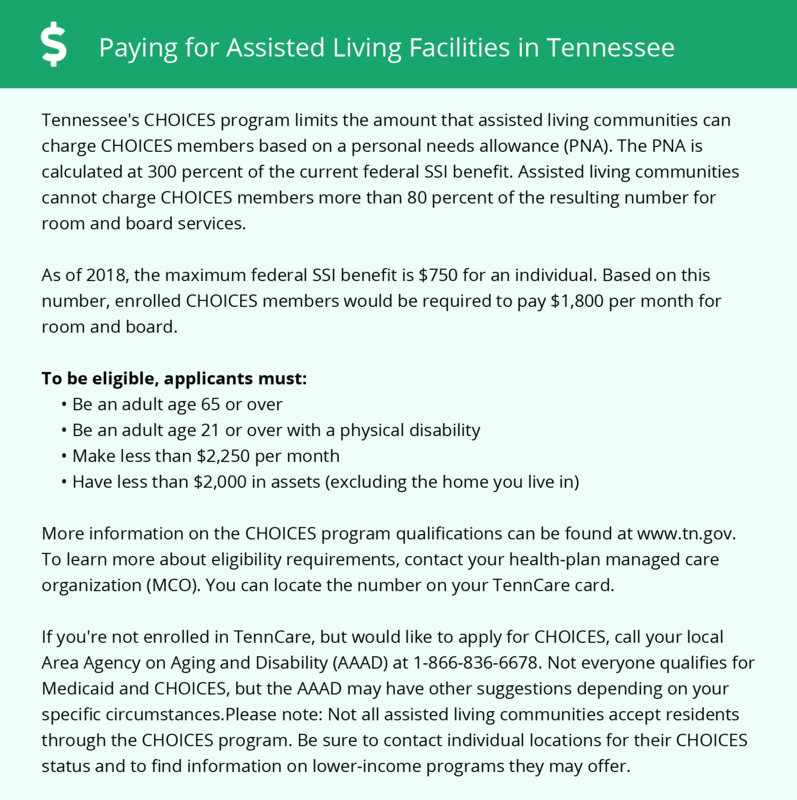 Seniors who need help paying for an assisted living residence in Madison and the state of Tennessee may be eligible for assistance through the state’s Long-Term Services and Supports CHOICES program. The CHOICES program sets the personal needs allowance at 300 percent of the federal Supplemental Security Income (SSI) rate, which limits the amount a facility can charge for seniors on the program. Family supplementation is permitted for those who prefer a private room. To see a list of free assisted living resources in Madison, please visit our Assisted Living in Tennessee page. Madison-area assisted living communities must adhere to the comprehensive set of state laws and regulations that all assisted living communities in Tennessee are required to follow. Visit our Assisted Living in Tennessee page for more information about these laws.